"Viva Latin America!" exulted Guatemalan actor Oscar Isaac after Coco won the prize for best Animated Feature at the 90th Academy Awards in Hollywood. After winning the Golden Globe, BAFTA and multiple Annies this awards season, an Oscar win has catapulted the film into an exclusive club of animation "grand slammers", which include Pete Docter’s Up and Inside Out, Brad Bird’s Ratatouille, and Chris Buck and Jennifer Lee’s Frozen. 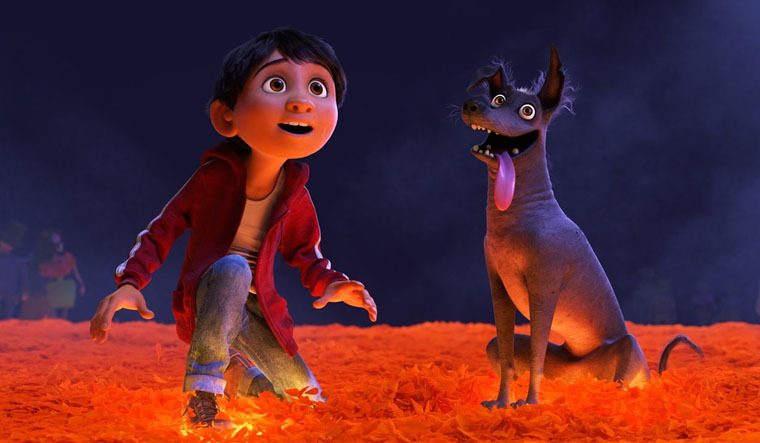 But more than boasting a glittering haul of trophies, Coco's win stands out as a resounding political statement in the shadow of the Trump presidency, apart from demolishing many genre conventions. The Pixar-animated film has an all-Latino cast and integrates in its colourful world themes, the Mexican holiday Día de los Muertos (Day of the Dead). The story tracks 12-year-old Miguel (Anthony Gonzalez) in the breathtaking Land of the Dead. Miguel wants be a famous musician like his idol Ernesto de la Cruz , but is born into a family which has barred any association with music for generations. Miguel is in great need to prove his talent and finds himself transported into the afterlife where he gets to meet his dead relatives in the company of the charming trickster Hector (Gael García Bernal). Together they embark on stunning journey to uncover Miguel's family secrets and return home. Beautifully conceived, the film took six years to make and has been noted for its concerns with uncomfortable themes like death and the afterlife even as it sits comfortably in the category of a children's film and a family watch. But in an edition of Oscars which many say has seen the maximum number of Black nominations—in itself symptomatic of a particular moment in the history of diversity in cinema—Coco's win adds yet another layer to an unfolding saga of openness at the prestigious awards function, especially at a time when political boundaries and protectionist policies are impeding the movement of people across geographies. As US President Donald Trump continues to push for a wall along the US-Mexico border, a wall he described during his presidential campaign as "impenetrable, physical, tall, powerful, beautiful", this cinematic achievement on US soil is a symbolic reminder of the futility of building physical barriers. They cannot stem the flow of powerful ideas and talented artists. As Guillermo del Toro wins the best director award for The Shape of Water this season and proudly declares, "I am an immigrant," in his acceptance speech, let us take a moment to celebrate this edition of Oscars for being at it political best.